This is one of those times where I wish I could rate a book twice: one on its audio version and one on its ebook version. The story is fantastic and had me biting my nails and trying to solve the mystery as I listened, but the narrator, while good, didn’t quite make it for me. He wasn’t bad. No. He just didn’t captivate me as much as the prose in the story did. So, let’s break this down, yes? The narrator, Greg Tremblay, does a good job impersonating the characters in this book. The voices he picked for them seemed pretty accurate, and reflected the characters well. The narration goes faster than in most of the audiobooks I’ve listened to, and it mostly worked for me. Mostly. The thing for me was that I felt that when the narrator was, well, narrating, instead of impersonating the characters, his voice was rather dull. Even if the reading was well paced, I struggled to focus whenever there wasn’t dialogue, so I found myself going back and rewinding several times only to catch up with what I’d missed. The thing is at this doesn’t mean that this was a bad audiobook. It just means that it wasn’t my style. So, don’t let me put you off listening. This could absolutely work for you. About the story. I found the story incredibly entertaining. I really enjoy suspense romance, and mystery books where solving murders is a key, usually get my full attention. What I enjoyed the most about this one is that all the things surrounding the mystery -the timeline, the clues, the suspects, the job of those suspects – all of it created a really cool and engaging atmosphere for me. If to all that you add that this was an enemies to lovers with a tense history and huge deals of sexual tension between them, well, that’s about all I need to go totally bonkers… In a good way. Dante is a half Mexican, half Cuban cop. Years ago he’d tried to catch a very sneaky (and smart) thief. Always unsuccessfully. Rook is the thief that Dante wanted to put in jail. When they meet again their chemistry comes off beautifully. Between banters, and teasing, and flirting (mostly on Rook’s part) one totally gets immerse in them. I craved the moments they spent together, even if they were fighting or driving each other crazy. I loved how their relationship went from enemies, to sort of friends, to lovers, and I loved how clearly and naturally it came in page. It just felt right, you know? Dante’s and Rook’s lives couldn’t be more different, and seeing them work this out was a pleasure. Their personalities don’t differ much, but where they do, the differences are huge. Dante is very affectionate, not at all scared of intimacy and showing himself vulnerable. For his part, Rook is scared shitless of intimacy, of depending, of trusting, of showing himself. They fit, though. Ina strange yet wonderful way, they fit. The secondary characters are wonderful too. Manny was a delight to read. A great uncle, and an important piece in Dante’s life. Archie, with his ups and downs and his slightly homophobic ways was someone I learned to like, if only because I realized that he would do anything for Rook. He was also very different from what we usually read as grandparents go. So, all in all this was an amazing read. One more thing (the Mexican in me won’t let this go, sorry) – while the Spanish here was pretty good, I would have liked to see a bit more phrases instead of words. There were parts where the author chose to go for a dialogue and then said “she said in spanish” but the dialogue was typed in English. I was a bit bummed by that. I understand why it’s done, though. 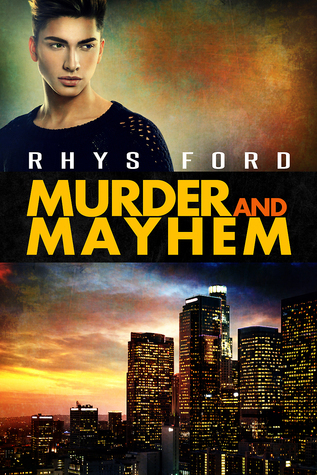 This entry was posted on November 3, 2015 by Gaby in Cops / Cowboys / Military, Genre, Mystery / Suspense and tagged 4 Stars, audiobook, Murder And Mayhem, rhys ford.